Ashley wasn’t actually quite finished with it yet. Besides the Post, she’s been featured in Vogue, US Weekly, Elle, and dozens of other publications. One thing that Ashley made very clear to me: art galleries are completely optional! You don’t need to give them 50% of your sale price! 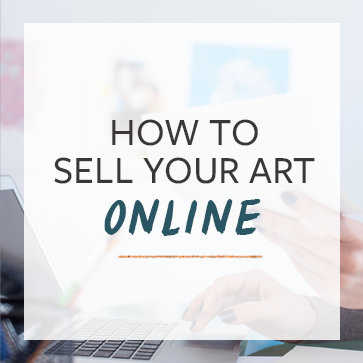 Ashley is a big proponent of artists learning the business side of art, and agreed to share some her own tips here. Ashley’s primary focus is building relationships. Some of Ashley’s collectors have known her for years. They call her up and talk to her like an old friend. They followed her to Instagram because she was enthusiastic about it, and they’re enthusiastic about her. Ashley is engaging, funny, crude and occasionally poignant. She responds to people when they email, tag, or otherwise communicate with her. She lets her freak flag fly. Ashley’s art reflects that part of her personality that many people would be repelled by – and that’s a big key to her success. People who enjoy her big personality enjoy following her on Instagram. “I like to laugh. I’m perverted,” she says. We talked for a while about whether or not artists need to be like her in order to sell their art. Ashley says no, of course not. But you should be you. Don’t hide behind safe art. Say something in your work that’s important to you, and the right people will connect with that work. You’ll notice on Ashley’s Instagram account that a lot of what she shares are hilarious pictures from the Internet with a little observation. Here’s an example of something very strange that gets posted to her account. I asked Ashley how she finds the weird images that are all over her IG feed. It’s a hilarious combination of random stuff she finds while she’s doing research for her existing work, drunk Googling late at night, and random inspiration at any time of the day. She once wondered whether or not Richard Simmons could do a toe-touch, so she found an image of it and then saved it on her phone. Some time later, she was scrolling through the 12,000+ images on her phone and found it, then decided to share it on Instagram. Her followers, of course, loved it. She caters to the collector’s Fear, Ego, and Enthusiasm. Many collectors, especially the wealthy ones, are seeking validation of their insecurities. Successful people, like the rest of us, fear missing out on the next big thing. Amongst their friends, that next big thing is Ashley’s work, so they can’t miss out. Ashley has a very impressive press kit. If you look at it, you can’t help but feel like she’s one of the biggest artists in the world. Ashley has an assistant that aggressively pursues media opportunities, which just makes her even more impressive. This media attention validates the collector’s choice and gives them something to brag about to their friends who don’t have one of Ashley’s pieces. Ashley makes herself accessible. When her collector emailed that morning about her new piece, Ashley was ready with a sales price and the ability to take their credit card number. This way, the collector’s enthusiasm doesn’t get cold. She plays the long game. Ashley Longshore has been a working artist for 23 years. She knows that if she continues to pursue relationships and is true to her own personality, the sales will come. This philosophy is working out well for her, but it was certainly a struggle early on. Ashley’s been there. You know, I’d love to use Instagram, but until they fix their technical issues, it’s a closed platform for me. I literally am unable to use it because of their tech problems. If you get one thing wrong setting up your account (actually, who knows what went wrong), you’re done, and it won’t let you fix it. Too bad. It sounds like a great way to market. I tend to agree with Kimberlee from my own experience with also. 🙂 They were really helpful, you just need to communicate your issues to them. SpiritPainter Instagram has hundreds of millions of users. I’m not sure that the technical problem is on their end. I’d encourage you to get it figured out and not let this get in your own way. It’s possible your account got hacked. Just start a new one and try to see if Instagram can consolidate them into one. On a side note, Ashley’s artwork is fun and vibrantly captivating. I often read about her equally colorful personality, and interactions with billionaires, jokingly addressing them as “MotherF….rs”. My thought: be careful not to let your personality overshadow your talent. Secondly, I read somewhere she came from money to begin with, no starving artist story here, so despite her late start in the art world, it was a very affordable endeavor to practice until fame came about. Also I believe her wealthy background already afforded her the contacts into a world of art buyers that most artists spend their careers looking at from the outside. So I’m not sure I buy into all her rhetoric about all it takes is hard work, it isn’t and she knows that well. My aunt taught me a long time ago: contacts are *everything*. If you do not have them, you will not get very far. Ashley always had the contacts from the beginning, thanks to her very wealthy father, Spencer Longshore III, the president and CEO of Time and Space Inc.
She had an extremely privileged background growing up: private boarding schools, ballet, jazz, tap, and voice lessons. SpiritPainter CoryHuff use another email?? If see my art , BUY IT , will be an original everytime , no prints and are worth the bucks as I put my magic in them . Not mass produced !! Will be limited and only the richest will be able to afford them . Can custom order . Hey, loved the information about Ashley Longshore, would just like to know who it was that wrote it? An authors name or written by is very useful when referencing information, thank you. If you’re talking about the New York Post article, there’s a link to it in the article. I am trying to sign up for the webinar course, but I am for some strange reason being blocked?? A red sign comes up saying ‘You are not authorized fro this site’??? I think this is an old blog post and the webinar is no longer available. 3 years + portraits, acrylic impressionist style, abstract, surrealistic sublime art. Art is a wonderful therapy…I just read about FREIDA to realize that suffering/pain and struggles are conveyed emotionally through one’s art. Identity of the viewer is essential…CONNECTION>!! I have to create a new portfolio currently not updated before I submit. I have great diversity of style, understanding of most art: It comes from our hearts/souls deepest emotional convictions of all kinds. AMAZING!